All changes subject to change! OCT 2017: New Public Inquiry into re-submitted Compulsory Purcahse Order for Aylesbury Estate! Support vital as well as cash for legal representation for Aylesbury leaseholders. Crowdfunding campaign here if you gotta a few quid spare! Thanks so much! SEPT 2016: Compulsory Purchase Orders for Aylesbury Phase Two rejected by Government! 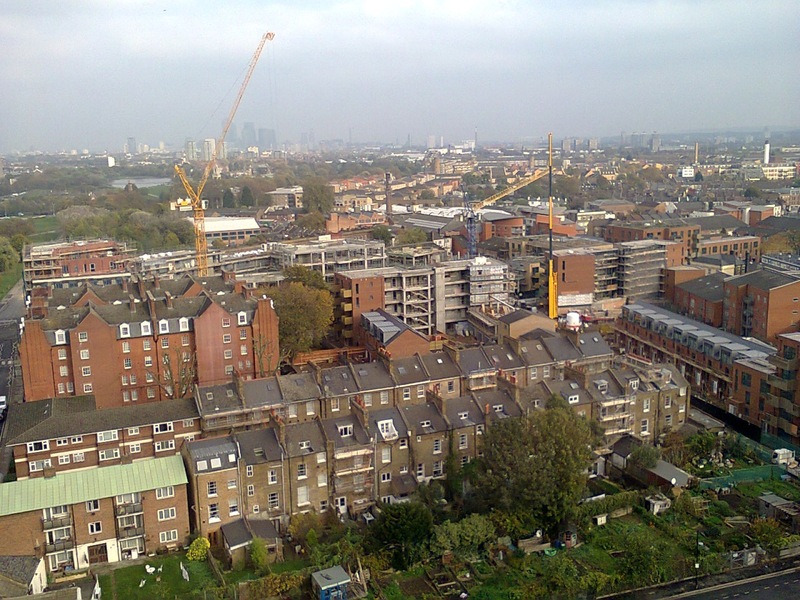 ‘In 2008, Kate Davies of Notting Hill Housing Trust contributed an Introduction to a Centre for Social Justice report on housing called ‘Housing Poverty’. She says ‘council estates are ghettos of needy people’. She says ‘council homes are subsidised by the taxpayer’ yet NHHT (and other Housing Assocations as well as private developers) receive millions of taxpayers money to build unaffordable homes. 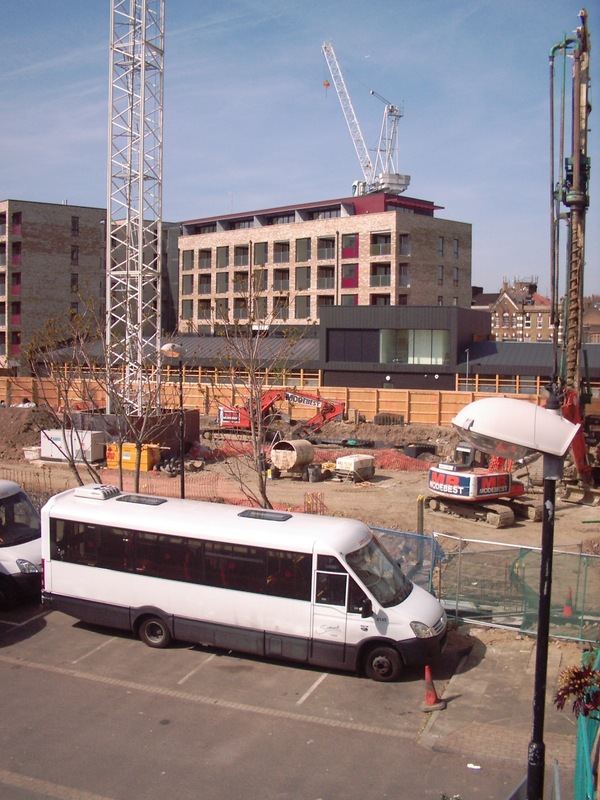 NHHT has been allocated £17m of funding to build 181 private rented homes in London. She says council tenants ‘often pay little or no rent, and get their home maintained in good order for free’. 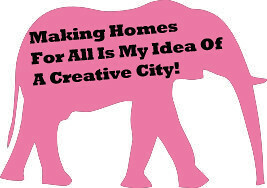 She also maintains that ‘living on an estate can affect your health, your ability to work, the type of education your children will get and your life chances’ To top it all she adds that ‘social housing is not a desirable destination’ and that ‘private ownership is preferable to state provided solutions’ i.e council homes’. Great reports here and here of this hugely important public investigation of the whole Aylesbury regeneration rip-off so far. 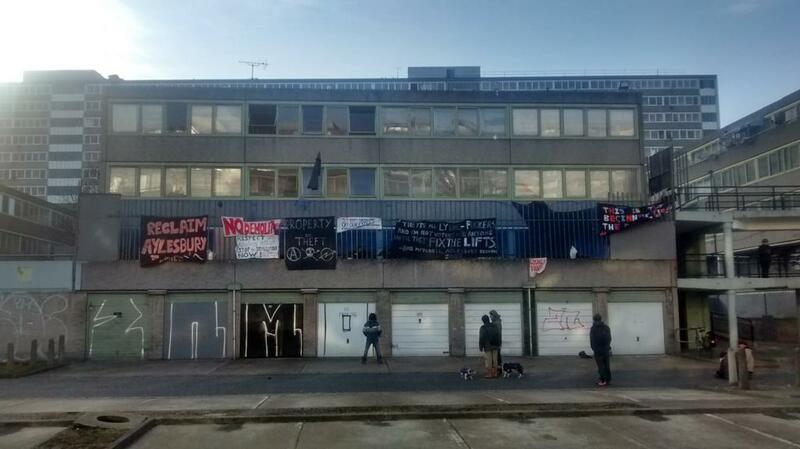 AYLESBURY ESTATE: WALWORTH’s LAST STAND? There is such a big story to the Aylesbury that encompasses the £57 million Aylesbury New Deal for Communities (ANDC) funding from Tony Blair’s Government in 1998, the No vote against Aylesbury housing stock transfer in 2001 and the 2010 collapse of the £180 million for the Private Finance Initiative ‘regeneration’. Not only that but there is within this the inheritance by Creation Trust (Aylesbury community development trust) of what was left of the money given to Aylesbury New Deal for Communities (ANDC) that had to be spent by 2010. 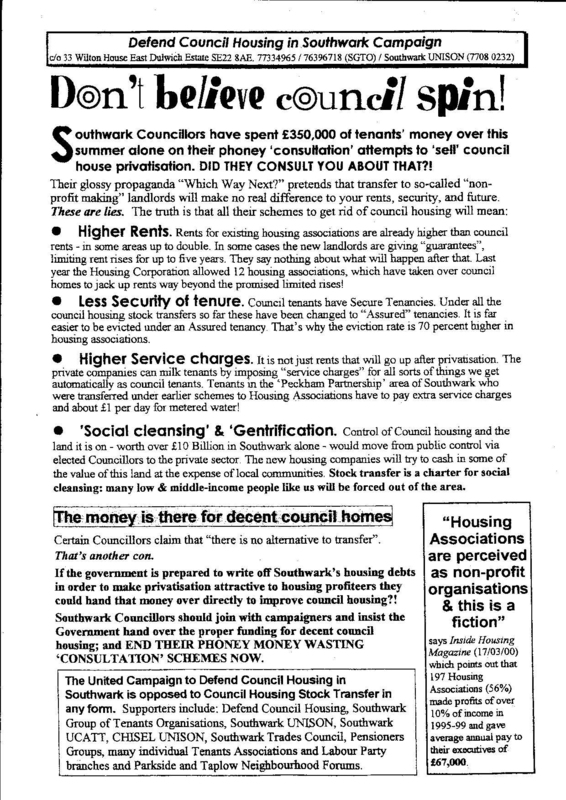 Some of this money was loaned by the NDC/Creation back to the Council for the Council to buy out Aylesbury leaseholders. This undertaking was subject to a formal contract, whereby the Council repays this ‘loan’ by funding Creation Trust (the ANDC’s successor organisation) on a year by year basis. 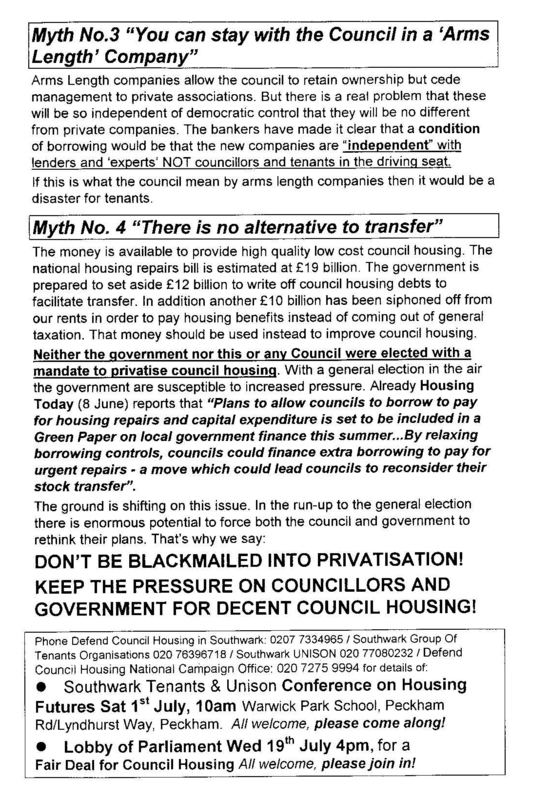 Some local people (including those involved in Aylesbury Tenant’s First) think that much of the millions spent has been wasted on the Council’s heavy PR campaign to gain resident’s acceptance for the demolition/rebuild scheme as if alternatives had not been put forward (refurbishment, part demolition etc). The familiar ‘Estate From Hell’ has, as ever, been the starting point for this PR campaign to demolish ‘one of Britain’s most notorious housing estates‘. This is exactly the same heavily pushed story that was used for the demolition of Heygate Estate. The first new buildings have arrived though now. There are some new London and Quadrant Housing Association flats going up just behind Camberwell Rd as part of Phase 1A that are part of the regeneration. We notice that this first new block is mainly social rented and intermediate rent. The next block have much more private housing factored in. What’s the real story with PHASE 1A? 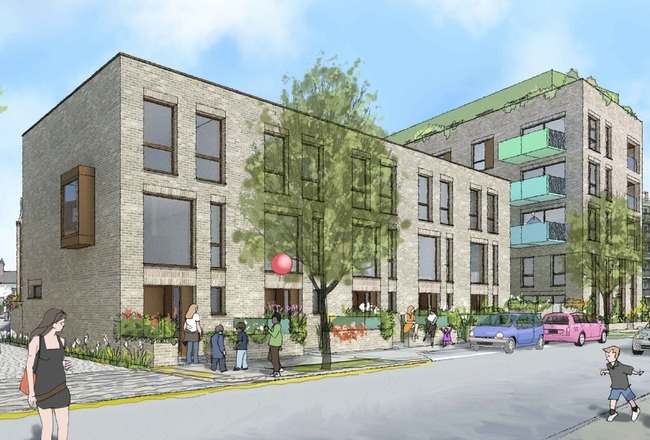 Aylesbury Tenant’s First make a good point: ‘The Council have a plan for the Aylesbury – to nearly double the density, financing new build Housing Association properties by the sale of neighbouring private homes. It is a plan, and a gamble, a gamble on the future buoyancy of the housing market. And that plan has now stalled.’ What would the future of the density and mix be if the housing market remains precarious? Would developers insist on less of mix to maintain expected profits? Creation Trust’s September 2011 minutes make the following point following on from the loss of funding: ‘At the time of writing the Aylesbury Action Plan each unit was supported with £125k of funding, this has now been reduced to £25,000 so market forces will have a great impact on what can be delivered’. Wolverton Block, Aylesbury Estate, L&Q Housing Association development. 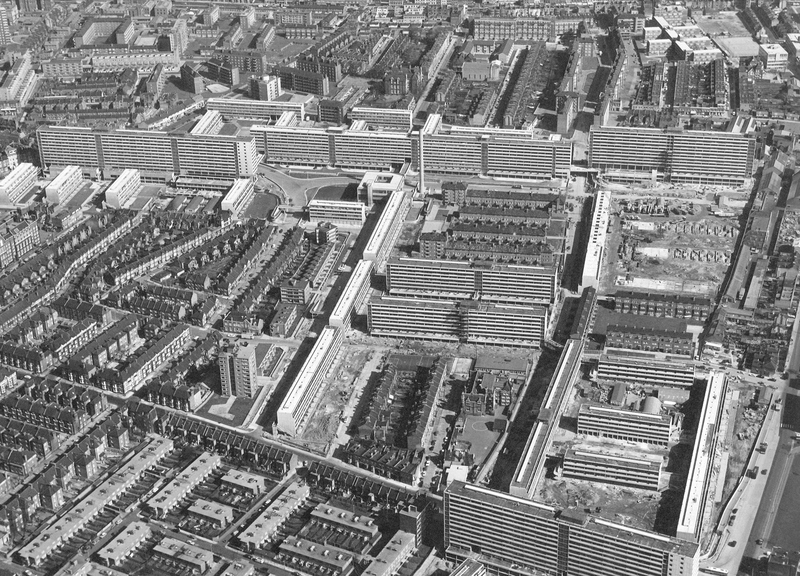 Notting Hill Housing Trust (NHHT) started out as a very small housing trust in 1963 with the buying of five homes in Notting Hill in West London. Started by Bruce Kenrick, also the founder of Shelter (one of the UK’s largest homelessness charities), he was appalled by the conditions people were forced by private landloards to live in. Shoot ahead in time to 2014 and NHHT now manages more than 28,000 homes and is one of the G15 group, an organisation which brings together the fifteen of the largest Housing Association in London. It is a serious player in the London housing market as both a provider and developer of housing increasingly moving away from truly affordable rent and more towards the provision of intermediate homes (part-buy, part-rent) and also private homes. 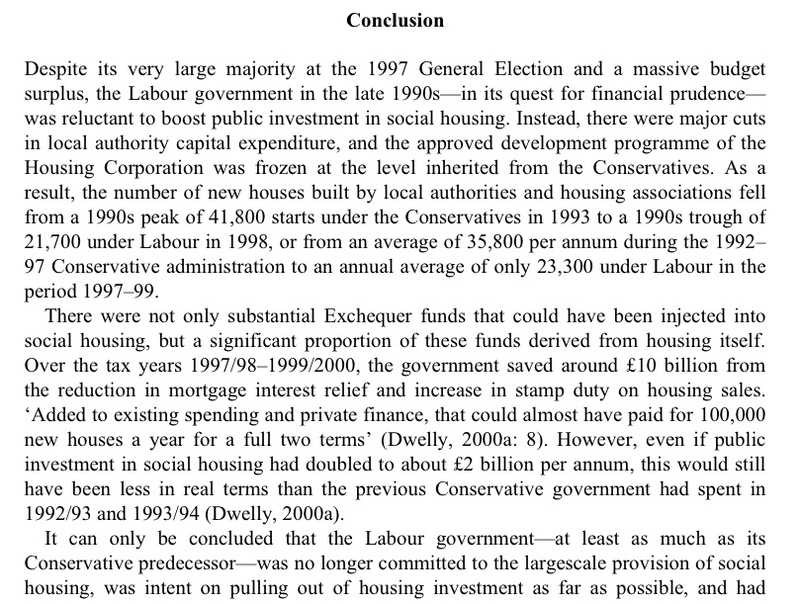 The argument is that the building and sale of private homes funds the ‘affordable’ housing provision. This is the same argument the Council uses for regeneration and that no alternative exists. Whereas the Heygate ‘regeneration’ was a devilish pact between Southwark and mega corporation Lend Lease who totally called the shots on the ‘regeneration’, the Aylesbury plans are now solely with NHHT (as of Jan 2014 when they beat L+Q for the next round of phased development there). This is not to say that NHHT will necessarily be any better when it comes to the final numbers of what is built that is genuinely affordable to both local people and other Londoners. The last few years has seen a somewhat ‘love-in‘ between Southwark and NHHT. 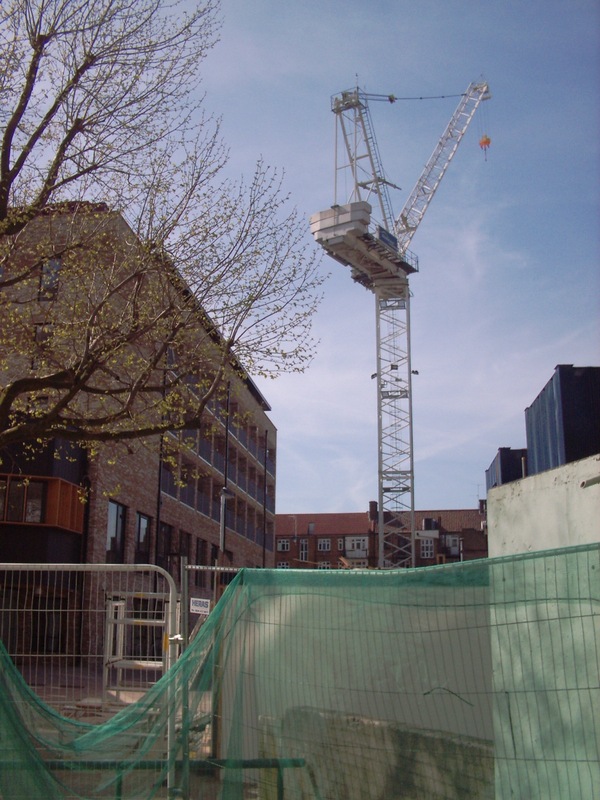 In fact, NHHT has become one of the biggest Housing Association players in the ongoing ‘regeneration’ of Southwark expected to provide hundreds of new homes in the next few years. 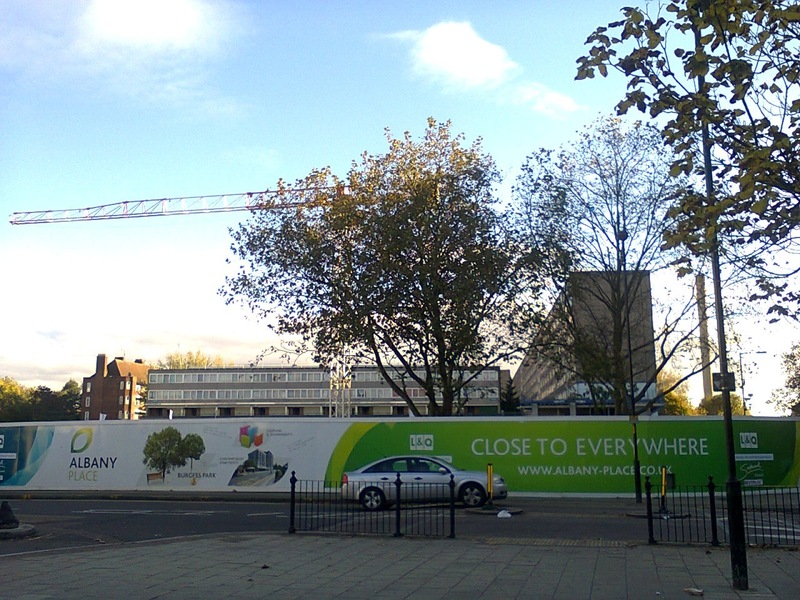 They are now the partner developers for the Aylesbury, the latter phases of the Elmington Estate in Camberwell (the shared ownership homes now known as ‘Camberwell Fields’! One bed flat from £360,000), the Wood Dene / Acorn Estate site in Peckham, the new builds at Bermondsey Spa (‘townhouses’ for £1M or minimum salary needed for shared-income £76,000 per year) and Blackfriars. They are also future developers of the old Manor Place baths site on Manor Place in Walworth. See here for Manor Place concerns! All of these ‘regeneration’ sites have or will result in a net loss of council homes. At Aylesbury, even if you factor in that 50% of the ‘affordable’ homes are promised to be at equivalent council rent rates, the final scheme provides less than the existing number of council homes. There will be a net increase in homes on the site from the original 2,700 to 4,200 but the final numbers for council-rent levels will be less than there was before. 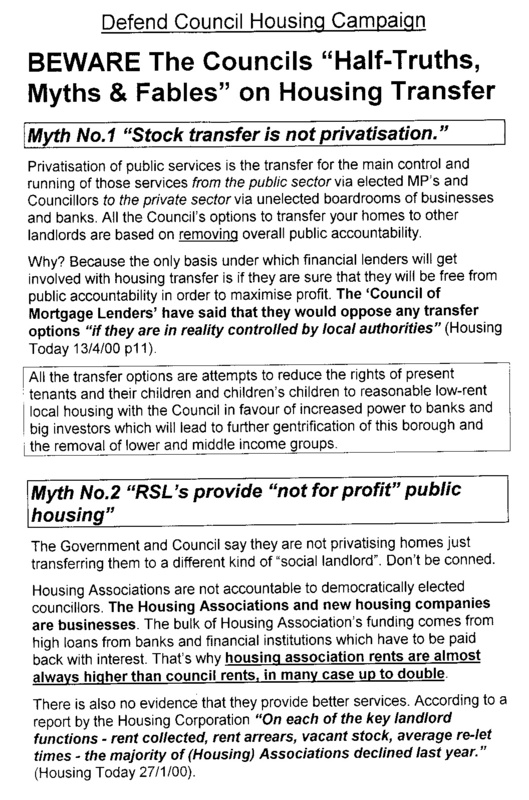 The same is true on Wood Dene site and is true on Elmington Estate site. Losing 600-700 council homes is not inconsiderable to a Borough with 18,000 people on the waiting list for affordable council homes. The above table shows Southwark’s own figures for loss of council homes due to regeneration in the years 2004 – 2013. 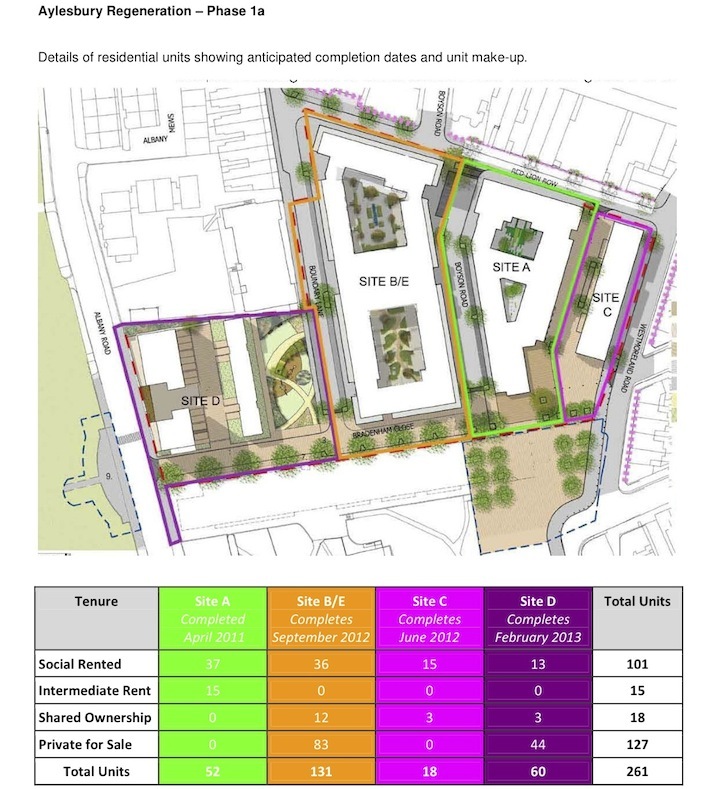 These figures are thus before Heygate Estate was demolished earlier in 2014. So that would add hundreds more lost council homes. Of course, some of the above regeneration might have added in more ‘affordable’ housing to the area but few of these offer the same security of tenure and rent levels as council homes. What is clear is that from 2375 losses, few if any new council homes have been built. 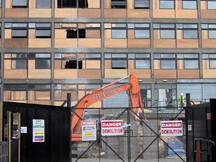 A July 2014 Freedom of Information request asked for the number of decanted Aylesbury council tenants since the regeneration had been started. The Council replied that their own figures showed that up until July 2014, a total of 387 tenants had been moved off the estate. These figures however only include those who used the Council’s own Homesearch scheme to find a new home in an existing empty Council property. Other tenants may have moved off ‘finding their own accommodation’. 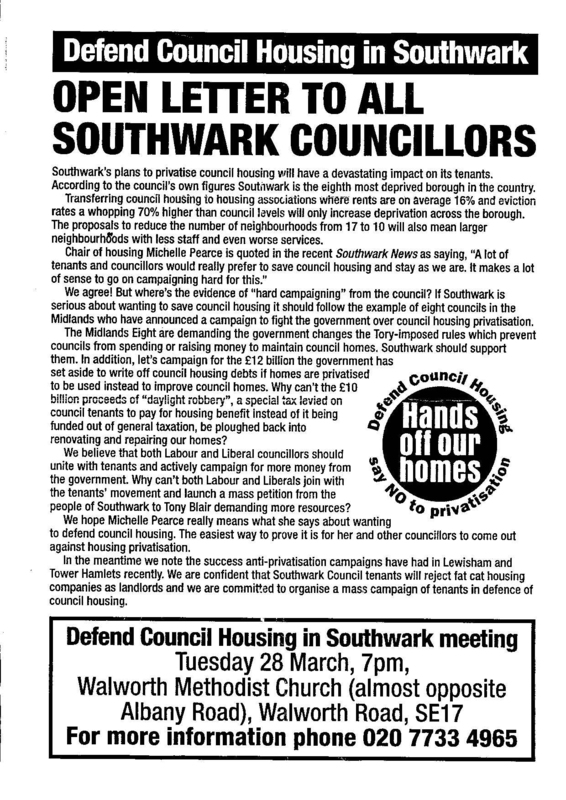 What’s important here is that, like Heygate decants, regeneration at it’s very outset is about demolishing vast numbers of much needed council housing and from the decanting of tenants into existing council homes taking these much needed homes from being available to those on the waiting list. If, after waiting years for new Housing Association homes to be built on Aylesbury sites, tenants do return then those existing council homes will be back in use for those on waiting list. 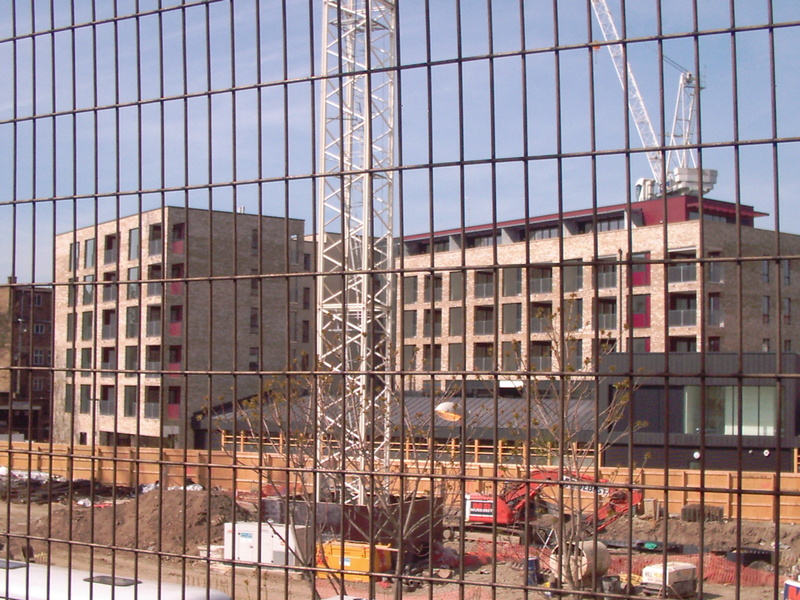 But Heygate experience shows that once people have moved once they tend to stay where they are. Out of interest, you can see from the figures above where those 387 went. About 47% remained in Walworth area. 16% went to SE1 area and 13% went to Camberwell. Smaller numbers of people moved further away in the Borough to Peckham, Forest Hill, Kennington etc. 2) THEY LOVE ‘AFFORDABLE RENT” BUT IT IS NOT ‘AFFORDABLE’! So you can see that whereas a Southwark Council rent for a two bed home might be £110 a week, NHHT affordable rent would be £250 a week. 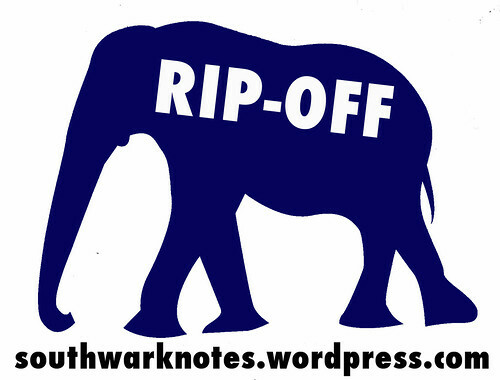 With local private rents increasing week by week and in part due to the continuing ‘regeneration’ schemes across the Borough (and everyone we knew who moved to Peckham five years ago because it was cheap have now all been priced out of the area! 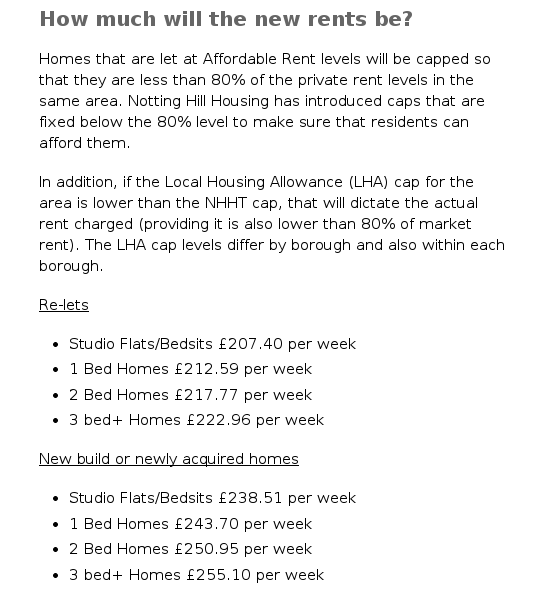 ), how does this affect any future NHHT new build that are at ‘affordable rent’ levels? What is odd is that the Council has already been aware and a little critical of the ‘affordable rent’ category stating in 2012 that ‘affordable rent will be very difficult for people in housing need to afford’. 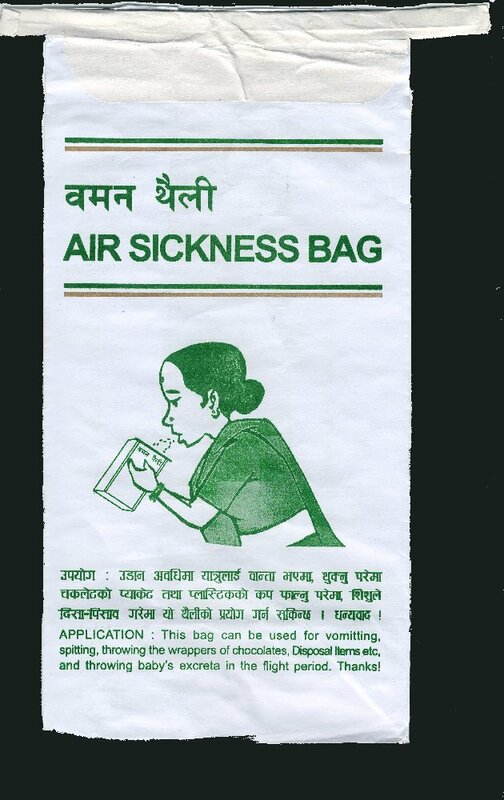 Yet they still decided to partner with NHHT for all these ‘regeneration’ schemes. NHHT insists that the Aylesbury regeneration will deliver non-affordable rents to those who are re-housed from the original estate. Okay, that’s great. But we remain wary of how promises made now can be somewhat different 3, 5 or even 10 years down the line. 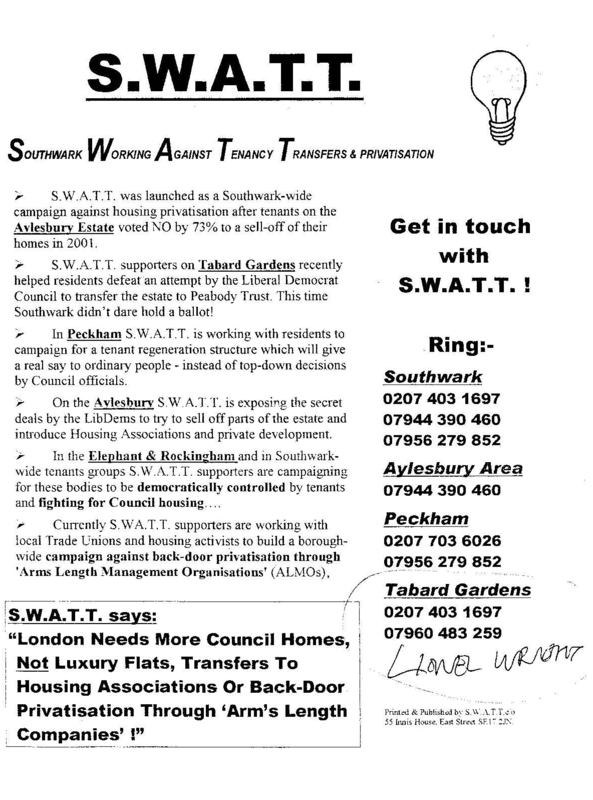 Just remind us of Heygate again! 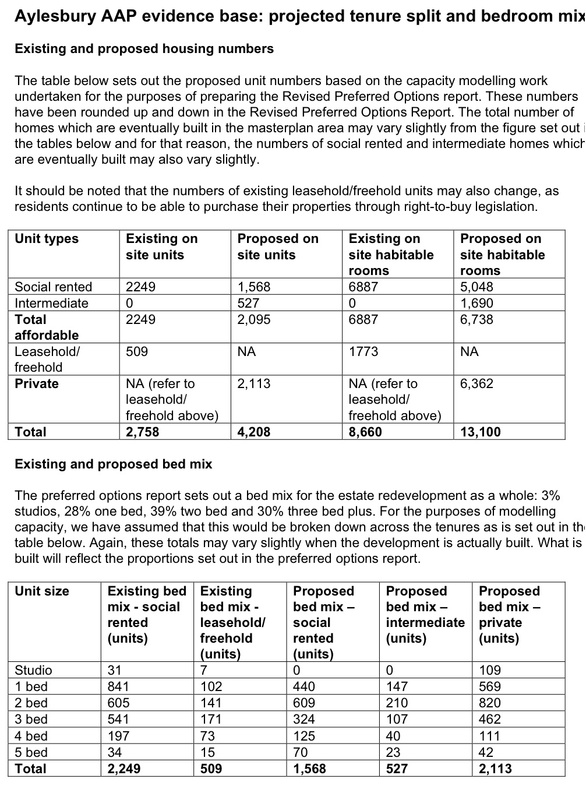 A further Aylesbury question is also the NHHT policy of how when a flat comes up for a re-let (i.e old tenants move one and new ones move in), NHHT then applies the new ‘affordable rent’ to the new tenants even if the old tenants were on the cheaper social rent category. If this is so, will this happen to any new tenants who come to the Aylesbury developments after any original tenants have moved out? There have been few real guarantees about the right of return to Aylesbury site from NHHT to tenants and there have been few real guarantees about what rent levels will be in the move of original Aylesbury tenants to becoming new NHHT tenants. This is certainly something that tenants there and local campaigns need to demand. We think something along the lines of a contract between the Council, the NHHT and tenants is needed that guarantees right of return to the site and hard promises on rent levels. Or this social division: Shared ownership residents banned from using gym on new Bermondsey estate. Unlike Heygate fiasco when they finally used Compulsory Purchase Orders on leaseholders who wanted a decent and genuine valuation offer on their homes, at Aylesbury the Council has got in quick. Once again it’s the same story, forcing long term residents to accept low valuations on their homes that means they will not be able to buy anything locally (offers of just £85k for a 1-bed and £165k for a 4-bed flat!). Their crime? 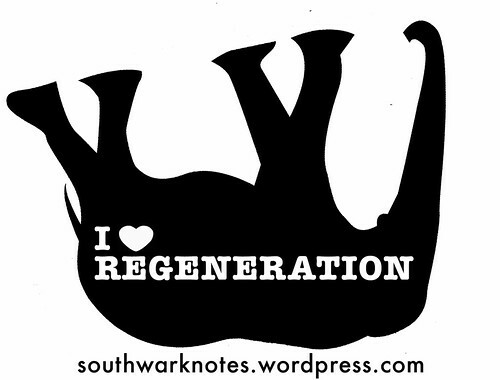 To fall under the regime of Southwark Council’s regeneration zone, hence all must sod off to enable regeneration to triumph! A bit of a regeneration benefit non-starter for these local people then. Leaseholders independent valuations put the homes as worth much more than Southwark’s paltry offers yet the Council refuses to accept such independent valuations despite them being made by qualified Royal Institution of Chartered Surveyors members, who must abide by strict professional codes of conduct. 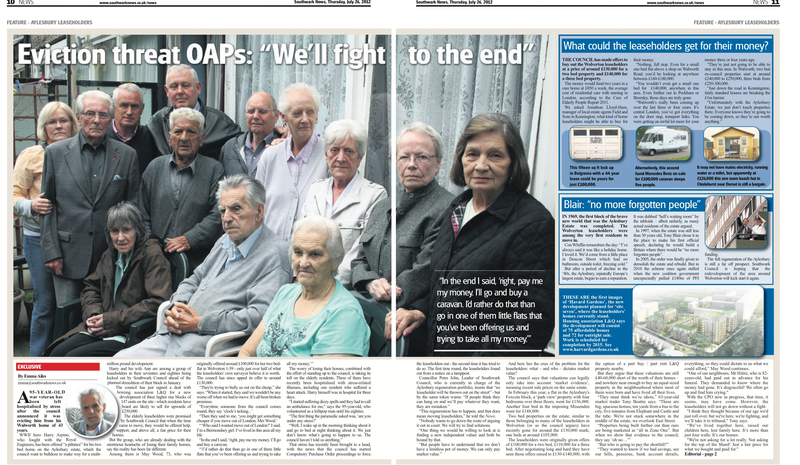 Insisting as if it was a good and generous thing that the Council is paying them ‘market value’ but in reality forces those who been living amongst relatives and friends there on Aylesbury some 30, 40 years, out of where they probably want to end their years. No doubt the Council will be happy to pay millions again to keep the estate empty for years awaiting development but will not be caring or generous enough to its constituents by actually helping these long term residents to stay local. 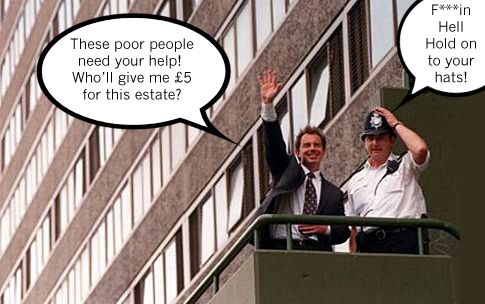 Council officer Paul Warner is asked difficult questions while conducting a valuation survey of a Heygate leaseholder’s flat ahead of the Compulsory Purchase Order. You can read all the shoddy going on foisted on locals here: about 42 more residents facing Compulsory Purchase on Aylesbury. 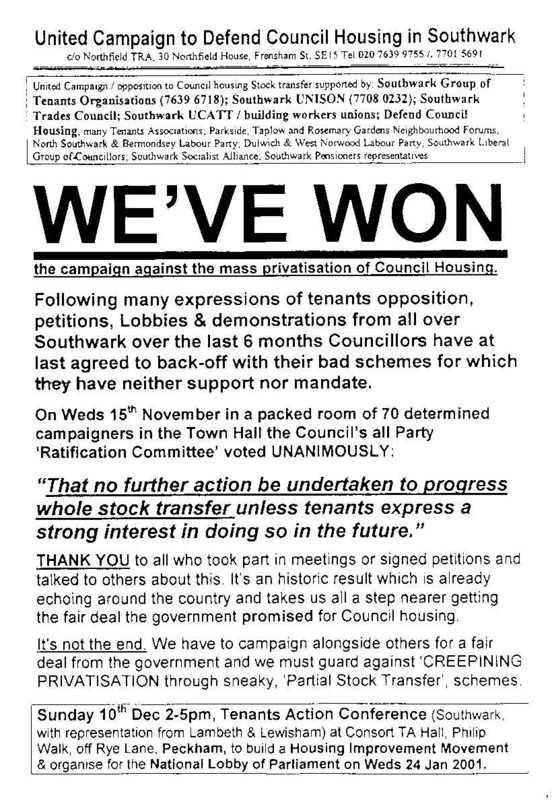 And here: ‘Another Aylesbury Leaseholder Goes to Lands Tribunal’. And here: ‘Southwark’s Rogue Landlords – Enforcement or Endorsement?’ Er..and here: ‘Aylesbury Leaseholder Fights ‘Incestuous’ Valuations’. And and and here Submission from G Mutch Aylesbury Leaseholder! 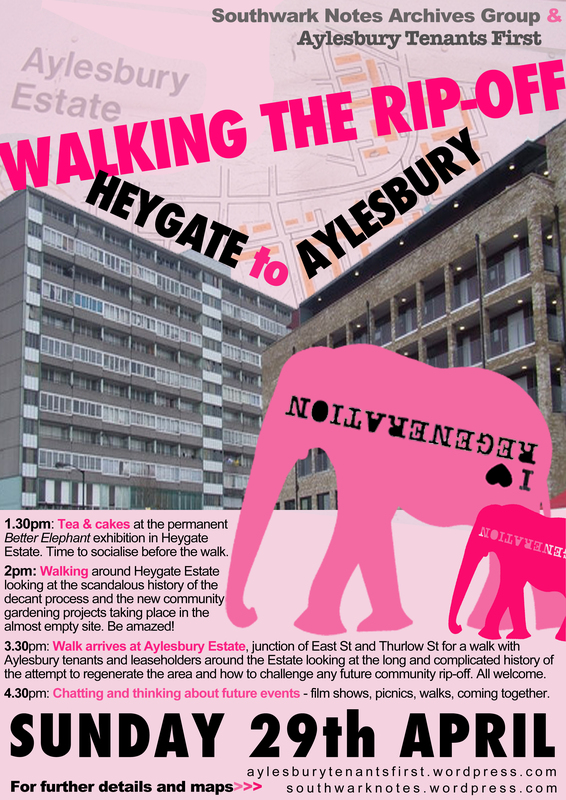 Aylesbury Leaseholders Action Group organising here. 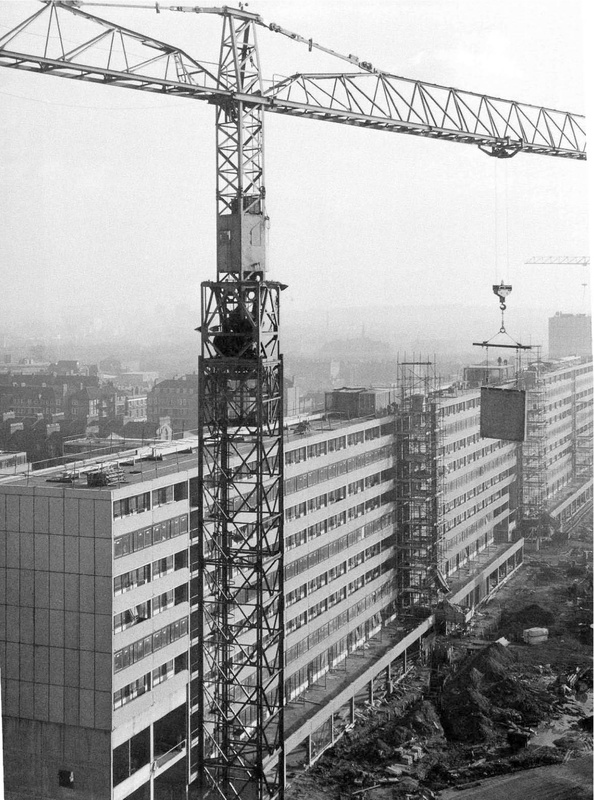 ‘…from the very first day that the demolition was announced, the social bond was affected, because people knew that ultimately within the next few years, they wouldn’t be seeing each other on a daily basis again. They wouldn’t be part of the same community. I’ve got a friend of mine – Terry – he could only afford to move out of the area with what the council was offering him and ended up moving into a home somewhere just outside Sidcup. Terry’s probably in his late 50s and he lives with his wife. He’s lived here all his life. He’s got people that would see him on a daily basis and his family lives here in the area. He’s now living there isolated just outside Sidcup having broken all of his social ties, he’s now suffering from severe depression…It’s not easy to build new social ties, especially the older you are…I mean the number of people I heard who’ve passed away as a result of having to move… for me, it’s genocide’ (interview, D, 2011). 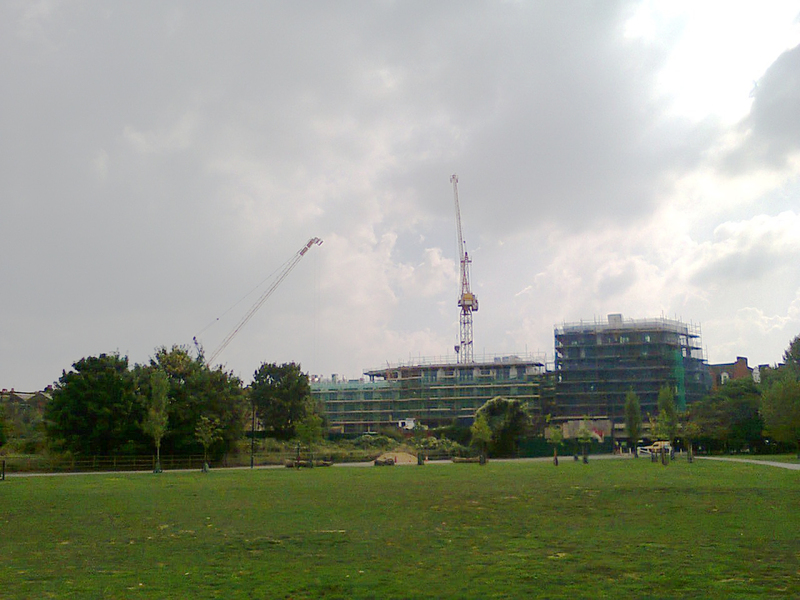 All we would say for now, is we hope that what happened on Heygate won’t happen to anyone who lives on the Aylesbury. 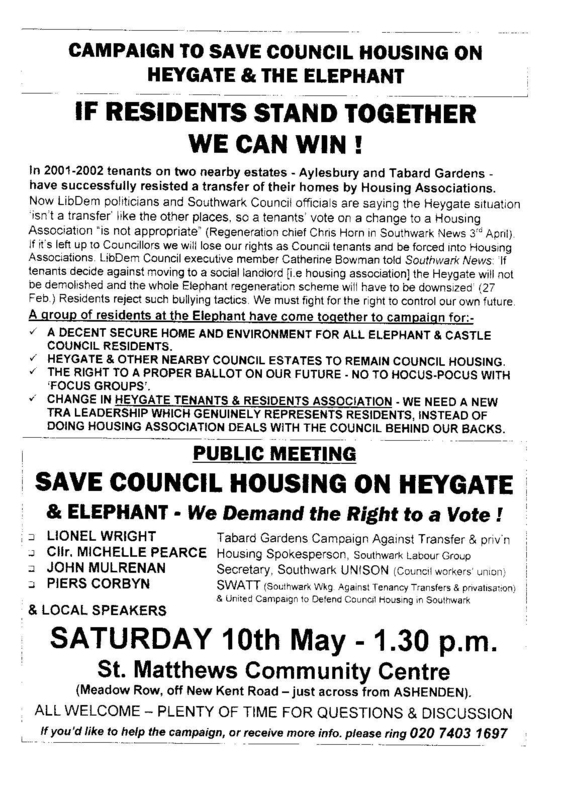 Heygate had a poll that voted to remain to remain as council tenants too! 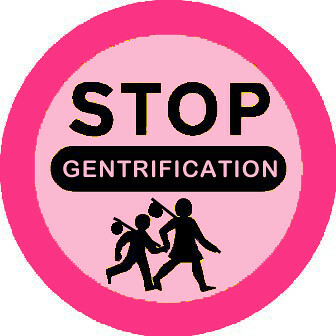 Hopefully there will be some local opposition to the steamrollering through of plans, sell-offs etc that are detrimental to the outcomes local people want – to stay local and for the number of council houses to remain the same or more!! Good luck! A good day out for all involved! Keep ’em peeled on further collaboration. If you live on Aylesbury, get in touch and tell us what you think about the regeneration process! • CHECK OUT NEW AYLESBURY TENANTS FIRST website!! 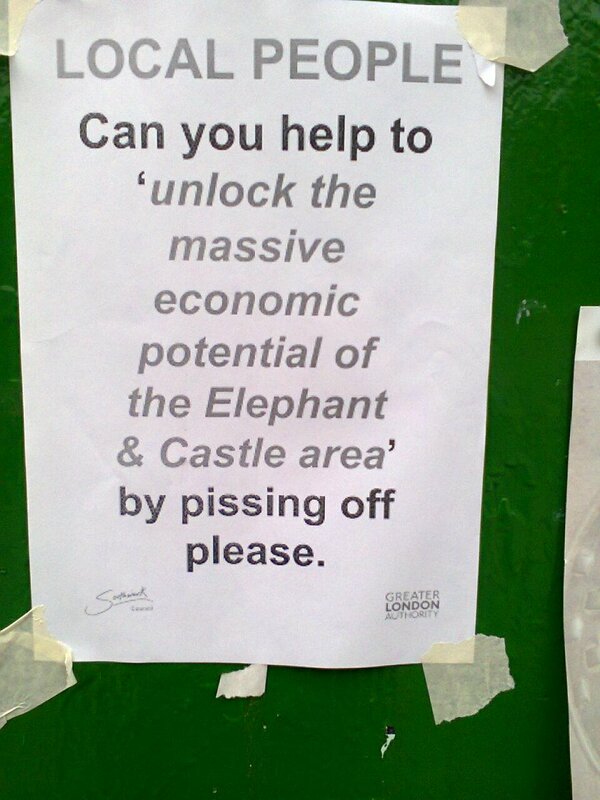 DEC 2011: Here are some notes we took from a chat with someone the other day: Southwark Council, realising that the strategy of developing the site bit by bit is untenable, are seeking one big developer to take on ‘regeneration’ of the whole estate (much like LendLease is for The Heygate site). There has been interest in this expressed by two possible big developers. The process of putting in the bid to do this will take another three years. Meanwhile – there were eight expressions of interest in the Wolverton site, whittled down to four, including the two big developers. They made detailed, researched, conscientious proposals and are engaging in the Council’s, and Creation Trust demands that they ‘think’ about job creation for ‘local’ people. The Council (and the developers) will be desperate to achieve vacant possession on Wolverton to start building in 2012. The plan will be to replace the existing 59 homes there with 165, including one medium high-rise block. There should be proportionally higher numbers of ‘affordable’ homes in this early stages of the scheme to rehouse existing residents. This is the key issue – the amount of genuinely affordable homes, in amongst the proposed 4500 or so new dwellings in the whole scheme, and on Wolverton is in no way guaranteed, and the Council will not be in a strong position to make demands about this. 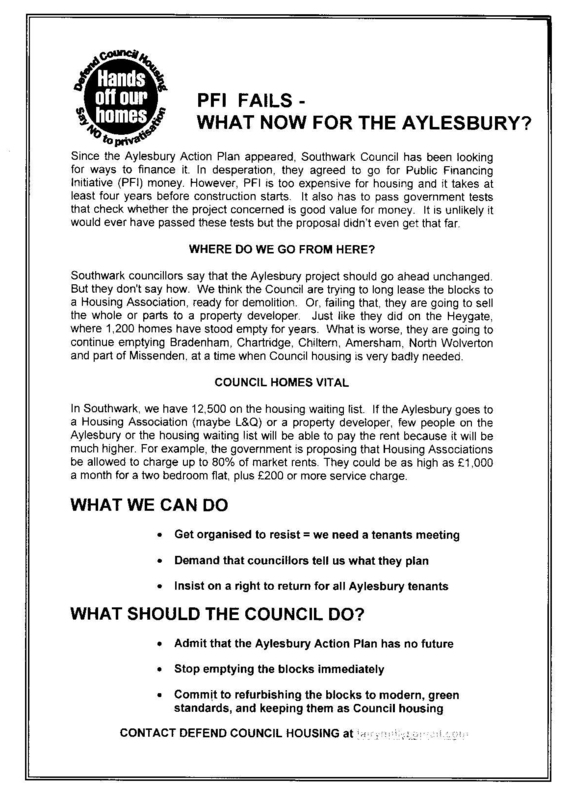 Remember – in the Council’s own plan The Aylesbury Area Action (Demolition) Plan – ‘the AAAP’ (calculated from their percentages) there would be about 700 fewer homes in total on this Estate for ordinary people to rent than we have now, and about 250 fewer family homes to rent, despite the density nearly doubling.